SOAP DISPENSERs are an essential accessory to any portable sink, toilet or restroom and are proven to encourage handwashing when offered. 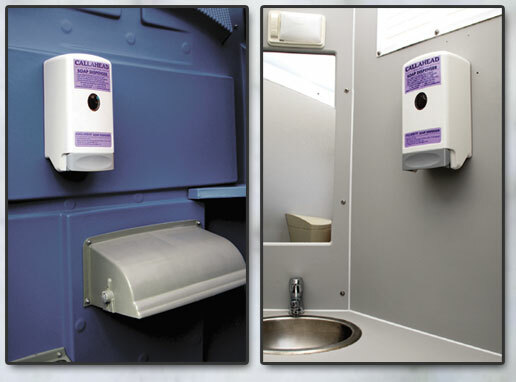 CALLAHEAD provides a SOAP DISPENSER with every portable restroom with an installed sink as well as every portable sink rental. The SOAP DISPENSER is filled with 800 ml of antibacterial soap that kills 99.9% of germs and bacteria that can cause serious illness. Every SOAP DISPENSER we provide is maintained by CALLAHEAD and refilled as needed, you never have to worry when your dispenser runs out. Requirements and health benefits of handwashing in accordance with The Center for Disease Control (CDC), The Occupational Safety and Health Act (OSHA) and The Center for Construction Research and Training (CPWR) conclude that proper hand hygiene is an essential part of preventing illness. Due to this conclusion, it is unquestionable that every employer, special event planner and host has an obligation to provide proper hand washing facilities for their employees and guests protection. CALLAHEAD always ensures our clients receive the maximum benefits from our equipment, and that includes our SOAP DISPENSERs and the soap we supply. Our extensive research from various governmental health departments has provided us with in-depth knowledge on proper hand hygiene so we may pass along these essential facts to our customers. CALLAHEAD thrives on being the greatest portable sanitation company in the nation, which is why we continuously explore new ways to develop and advance our equipment and service for our customers. Whether it's a construction job site or special event, CALLAHEAD has the inventiveness, decades of industry knowledge and largest variety of quality equipment available to outfit all of your portable sanitation needs. The Center for Disease Control (CDC) affirms, "Keeping hands clean is one of the most important steps we can take to avoid getting sick and spreading germs to others." • The Occupational Safety and Health Act (OSHA) require employers to provide adequate washing facilities for employees that work with contaminants that may be harmful. • The Association for professionals in Infection Control and Epidemiology (APCI) position, "Although people usually think that germs are spread through the air, the fact is that germs are most easily spread through HAND CONTACT." AND "One of the best ways to avoid getting sick or spreading illness is to wash OR to decontaminate your hands." • The Center for Construction Research and Training (CPWR) states, "Lack of cleaning facilities on construction job sites increases the likelihood of dermatitis, caustic burns from extended contact with wet cement, or acid burns from muriatic acid or other hazardous agents that come in contact with the skin, and infection." The result, additional workers' compensation claims. • The Center for Disease Control (CDC) estimates that 36,000 people die from the flu or flu-like illness each year, and another 5,000 people die from food borne illness each year. And your best protection from this type of illness is frequent hand washing. Stylish design that suits all environments. 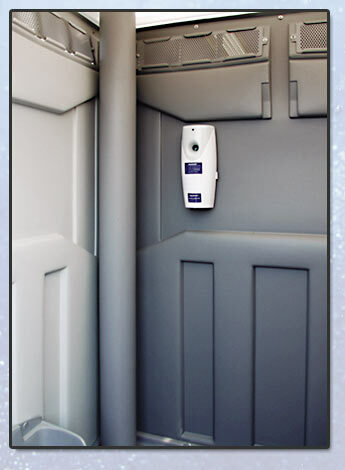 • Mounted inside portable toilet or portable sink systems. • Elegant large push button design for easy operation. • Regulated push tube system, which allows approximately 1,300 single shot uses. • Enclosed sealed dispenser to protect soap from contamination. • Maintained 100% by CALLAHEAD with antibacterial soap refilled as needed. Handwashing is a simple habit, something many people do without thinking. Yet handwashing, when done properly, is one of the best ways to avoid getting sick. Despite the proven health benefits of handwashing, many people don't practice this habit as often as they should, even after using the toilet. Throughout the day you accumulate germs on your hands from a variety of sources. If you don't wash your hands frequently enough, you can infect yourself with germs by touching your eyes, nose or mouth. Infectious diseases that are commonly spread through hand-to-hand contact include the common cold, flu and several gastrointestinal disorders. While most people will get over a cold, the flu can be much more serious. Some people with the flu, particularly older adults and people with chronic medical problems, can develop pneumonia. The combination of the flu and pneumonia, in fact, is the eighth-leading cause of death among Americans. Inadequate hand hygiene also contributes to food-related illnesses, such as salmonella and E. coli infection. Handwashing is a simple habit that saves lives and should be practiced by all! Using the bathroom. • Handling irritating substances such as acids, solvents, or cement. • Before, during, and after preparing food. • Eating food. • Touching garbage. • Caring for someone who is sick. • Before and after treating a cut or wound. • Changing diapers or cleaning up a child who has used the bathroom. • Blowing your nose, coughing, or sneezing. • Touching an animal or animal waste. • Inserting or removing contact lenses. • Touching a sick or injured person.